As a born again Christian your know and see that you are not perfect and that Jesus died on the Cross for all your sin's. That you can not save your self, that you need a savior to save you. Save you from Hell. 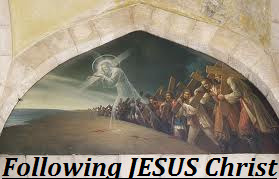 As part in recieving Christ you make the chose to follow Jesus Christ and do as he says, like a older brother tells a younger brother to do something. Then he called the crowd to him along with his disciples and said: “Whoever wants to be my disciple must deny themselves and take up their cross and follow me." "...deny themselves..." This is recieving Christ into your life, you just saying that you yourself can't save your own soul, and that you need Jesus. "...take up their cross..." Following Jesus not going to be fun, as you grow more in faith in him, more and more people will be drawn by the devil to hate you. May even kill you. Think about when Jesus carryed his real cross, and what people was doing to him, same things or less, will happen to those who follow him. "...follow me." This right here is when many Christian turn back around there own way, and walk from Jesus way. Your not going to be saved if you do walk away the minute you see you don't want to follow him and his way. The Next two parts in away go together. Jesus says that not everyone who calls on him will be saved but those who do his farthers WILL. The Will of God is that we place all our life and things in the hands of God, and have Jesus Christ as out foundation in our life.